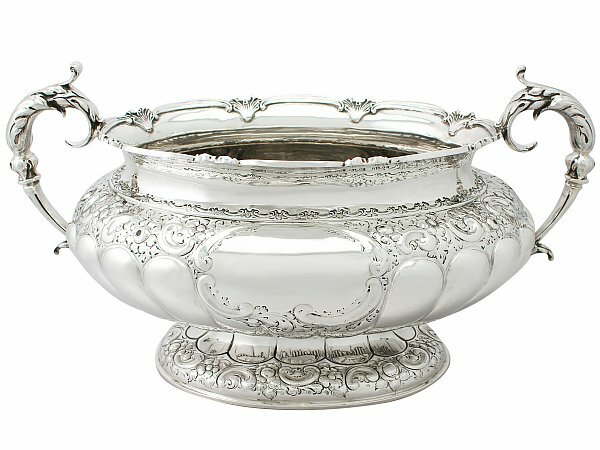 This magnificent and large antique Victorian sterling silver centrepiece has an oval compressed form onto an oval domed foot. The lower portion of the body is encompassed with broad convex fluted decoration. The shaped rim of this impressive antique centrepiece is ornamented with applied scroll decorated border accented with stylised leaf motifs to each incurve. 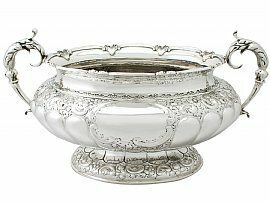 The centrepiece is fitted with two impressive cast silver scrolling knopped handles, ornamented with large leaf decoration incorporated into the scrolling thumbpieces. The foot of this magnificent bowl is encompassed with further fluted and chased floral decoration, reflecting that of the body.